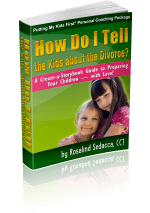 Start at 18 minutes to listen to my friend, Rosalind Sedacca, the Voice of Child-Centered Divorce. Here is a great resource to help tell the kids! Rosalind wrote this book and it comes with a personalized book to help normalize your experience for your children. There are versions for younger children and for teens. I know it’s not easy, and there is a lot of wounding that takes place around a divorce. Rosalind lays out a practical plan of action, and if you follow her suggestions you will ease the suffering for your children. They can come through this strong and powerful and happy. I hope this resource helps you make it as easy as possible for your children (and for you too! ).